Nestled in the foothills of the Rif mountains, around twenty miles from the Mediterranean coast, is Chefchaouen (sometimes just ‘Chaouen’). 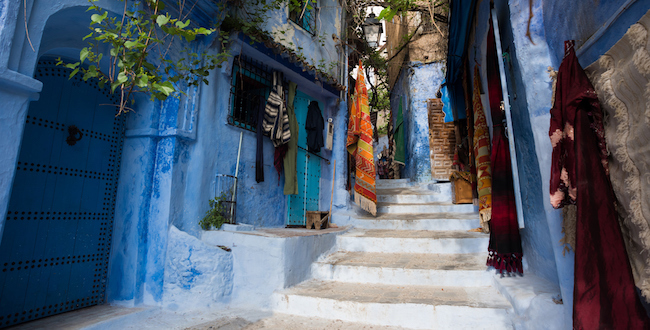 Known as ‘Morocco’s Blue City’ people visit from all around to walk through the town and see the vividly painted buildings, alleys and even paths. After a rain shower the wet blue walls glisten, and throughout the day the town glows in different shades from subtle aquamarine to vivid Majorelle blue as the sun travels through the sky and the light changes. It’s a wonderful experience and a sight you’re unlikely to see anywhere else. 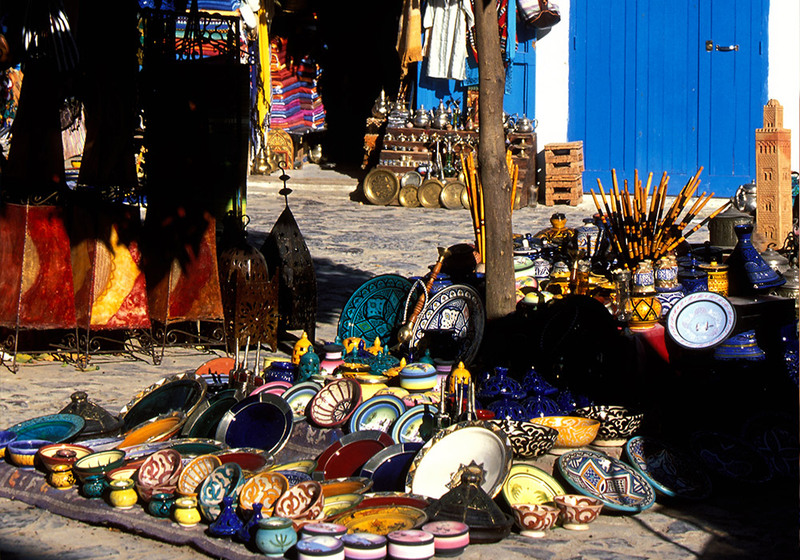 Chefchaouen is somewhere where you can enjoy a real, authentic experience of Morocco, with traditional markets, hammams and restaurants to enjoy. It’s ideally placed for venturing out into the countryside too; as well as the beautiful Rif mountain range you have the Jebel Bouhachem Nature Reserve on your doorstep, and the Talassemtane National Park on the other side of the town. 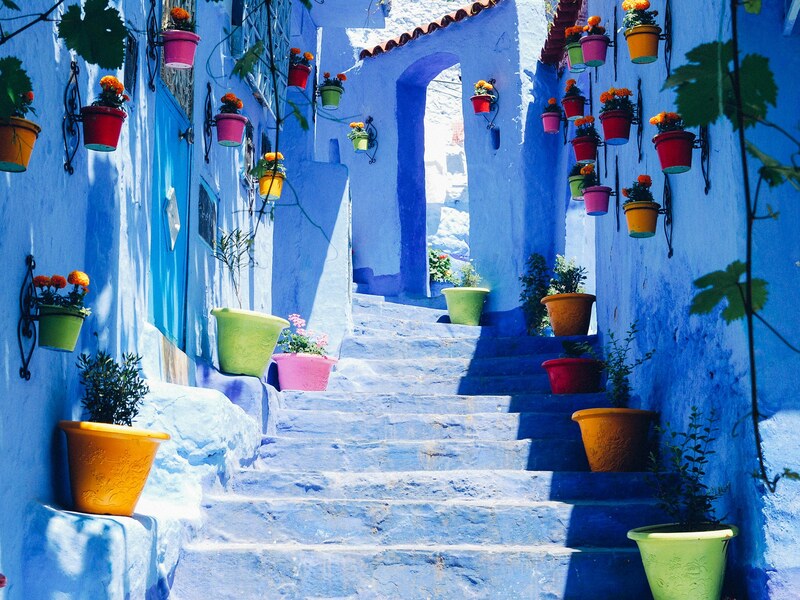 Whether it’s the influence of being surrounded by nature, the cool blue walls or the natural hospitableness of the Moroccan character, Chefchaouen is famous for being a friendly, relaxed place to visit. 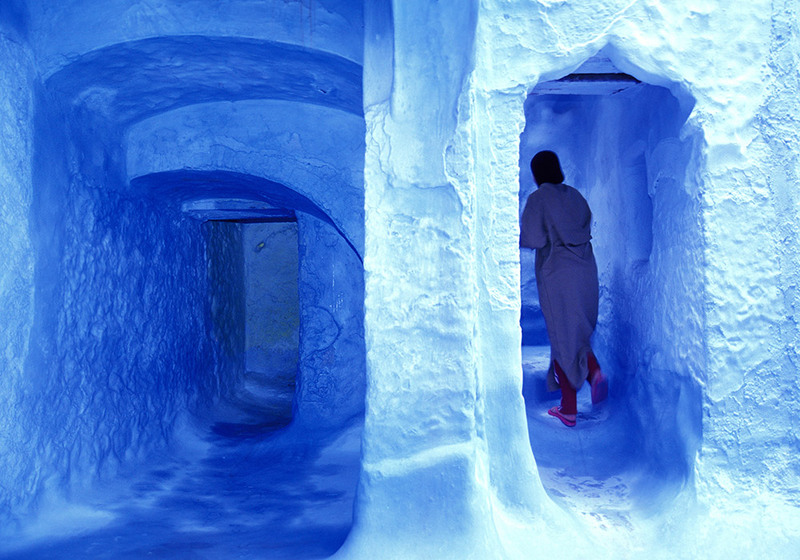 It’s certainly somewhere you don’t want to miss on your next visit to Morocco. Every day the scent of baking bread and aromatic herbs fills the streets as dozens of bakers and chefs start work, their wood-fired ovens producing bread, tagines and other tantalising dishes. Their wares are soon available to sample, whether from street food vendors or the many restaurants that can be found up and down the twisting turning alleyways. 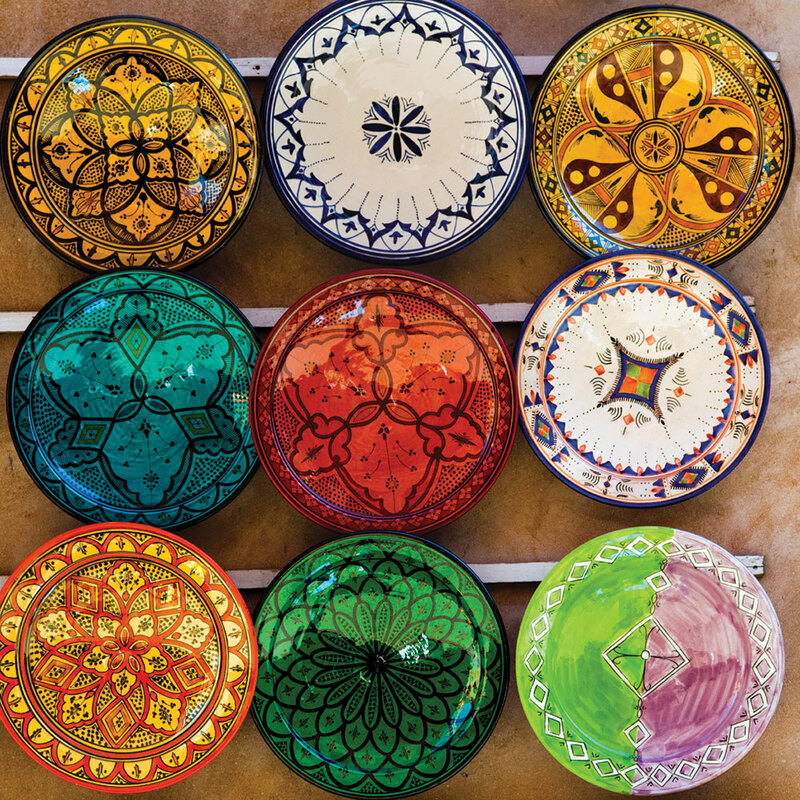 As is the Moroccan way, most meals are flavoured with a selection of spices, often turmeric, paprika, cumin and more, to give them that distinctive North African quality. At the same time there is a distinct Rif vibe to the food, with local variations on Moroccan themes that keep it distinct. Fresh is always the order of the day, with locally ingredients used as much as possible to ensure the quality and the taste. The goat’s cheese in particular is a delicacy that is only available in the Chefchaouen area. 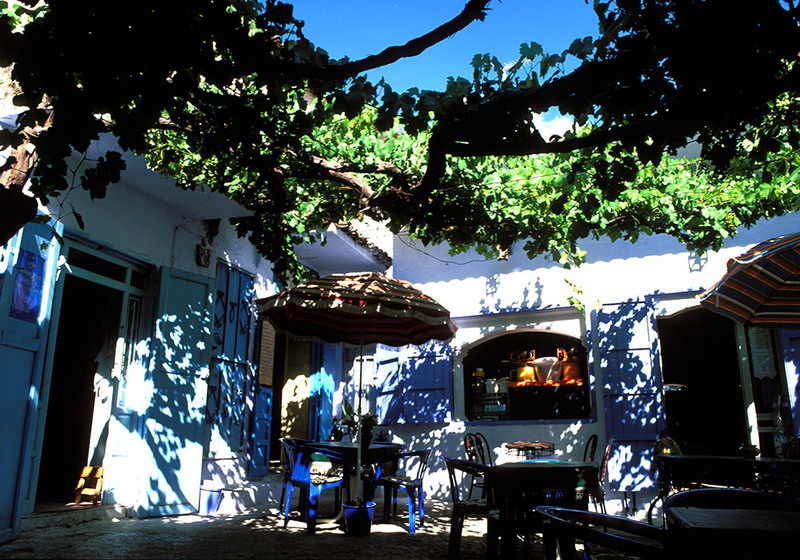 Chefchaouen was founded in 1471 by Jews and Moors fleeing from the Reconquista of Spain, and it was later to provide a Jewish refuge once again, this time in the 20th century, acting as a sanctuary against their Nazi persecutors. This second influx of Jewish settlers are thought to be the instigators of Chefchaouen’s most salient feature – blue is a holy colour in Judaism, a reminder of God’s glory – and despite the majority of Jews moving to Israel in 1948, the people of Chefchaouen still repaint the town every year to maintain its famous blue hue. 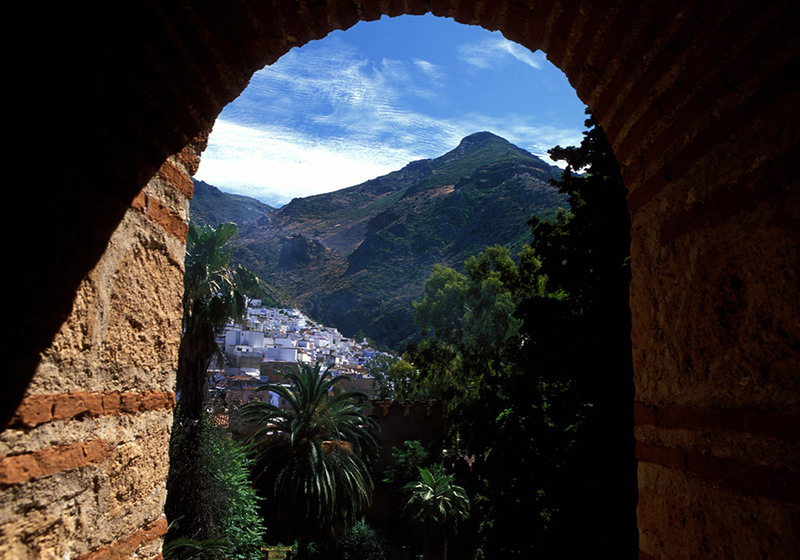 The town is a fantastic example of how an Andalucian settlement would have looked in Moorish times. 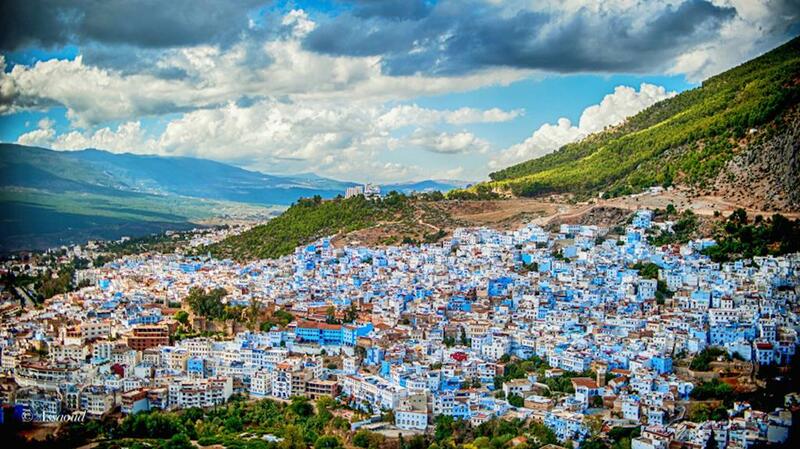 At the centre of Chefchaouen is the 500 year old fortress that the rest of the town grew from. Inside is an ethnographic museum where you can see pictures of historic Chefchouen, and you can look round the old prison and climb a tower to give you a spectacular view of the town today. Image: Morocco isn't all desert! 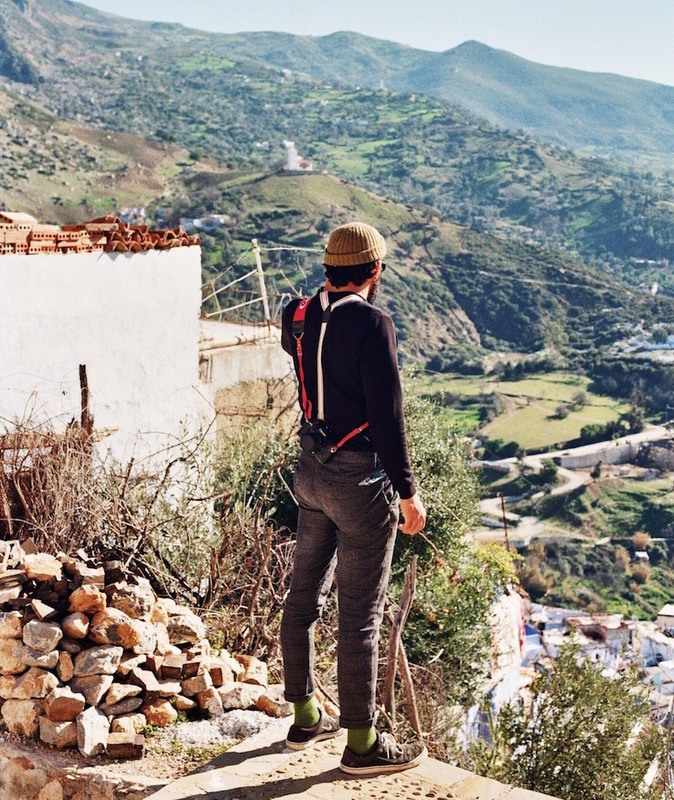 If you’re any sort of walker then you won’t be able to resist the lure of the Rif mountains that surround Chefchaouen. Take a day hike or a longer trek and you’ll enjoy some fantastic walking and amazing views. At higher elevations the slopes are dusted with snow, and the sparkling waters of the Mediterranean can be seen on clear days. 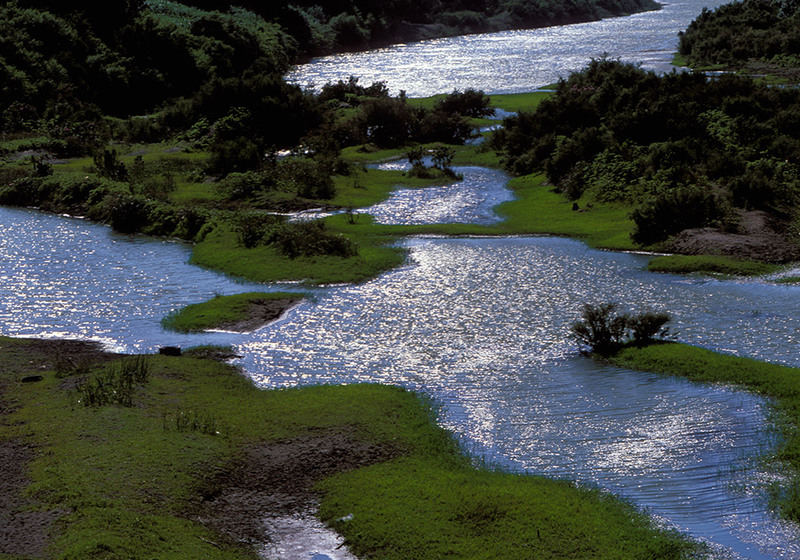 The nearby Talassemtane National Park is also a must visit. Lush green valleys, burbling rivers and rushing waterfalls await you in this beautiful part of the kingdom that covers over 580 square kilometres. God’s Bridge is one of the highlights here – a natural red stone arch that crosses the river fifty feet below. 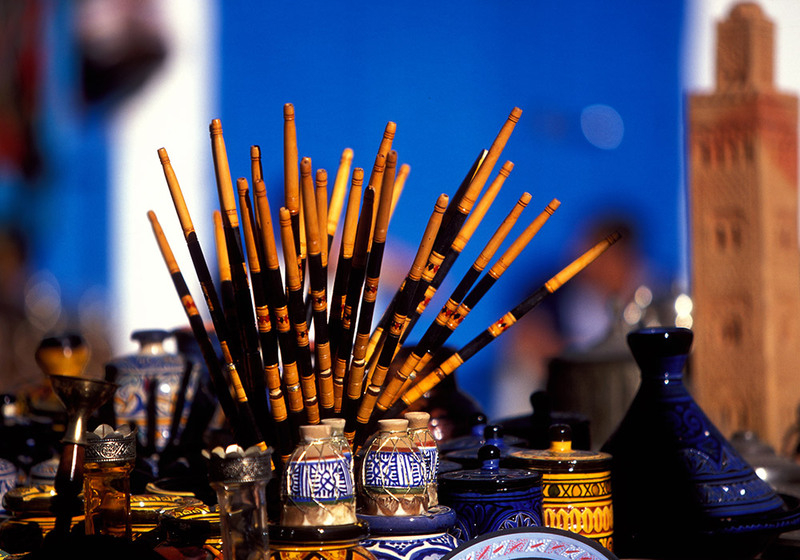 As with most places in Morocco there are professional companies who are happy to offer tours that are tailor-made to your wishes and your abilities. Run by local experts they can safely show you all the best views and the secrets that you would never find on your own. 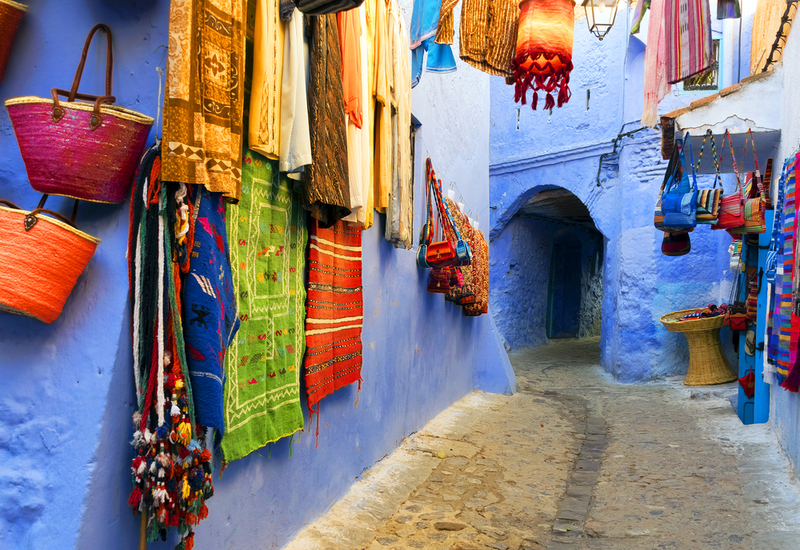 Chefchaouen is understandably a popular place for travellers to visit, so there are plenty of hotels, riads and hostels available to cater for the demand. Many have roof terraces where you can spend a pleasant evening watching the sun set over the mountain tops. 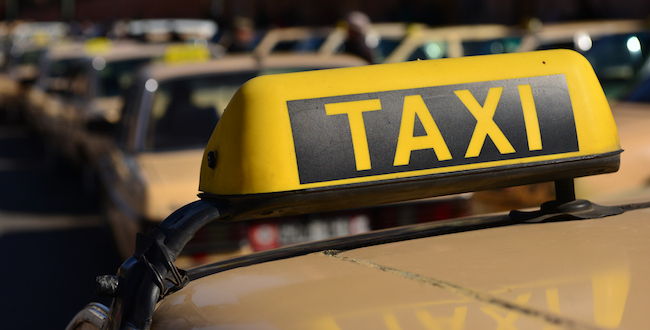 Most people reach Chefchaouen from Tangier, either taking the regular bus service, hiring a Grand Taxi or a private transfer. The main bus station is about fifteen minutes walk from the medina (and this is uphill, so if you have mobility difficulties it's probably best to use one of the petit taxis that can be hired at the station).